At the latest On the Ground event in the Gratiot-Saginaw State Game Area, volunteers Christopher Martello and Kelly Haughn helped to build brush piles for rabbitat in the area. 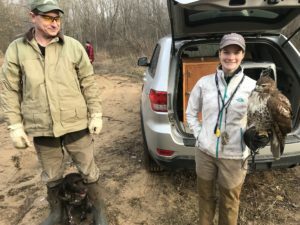 They also brought along their juvenile Red-tailed Hawk, Vesper, and Small Munsterlander, Kita, to hunt a few areas where brush piles have been previously built by volunteers with OTG. 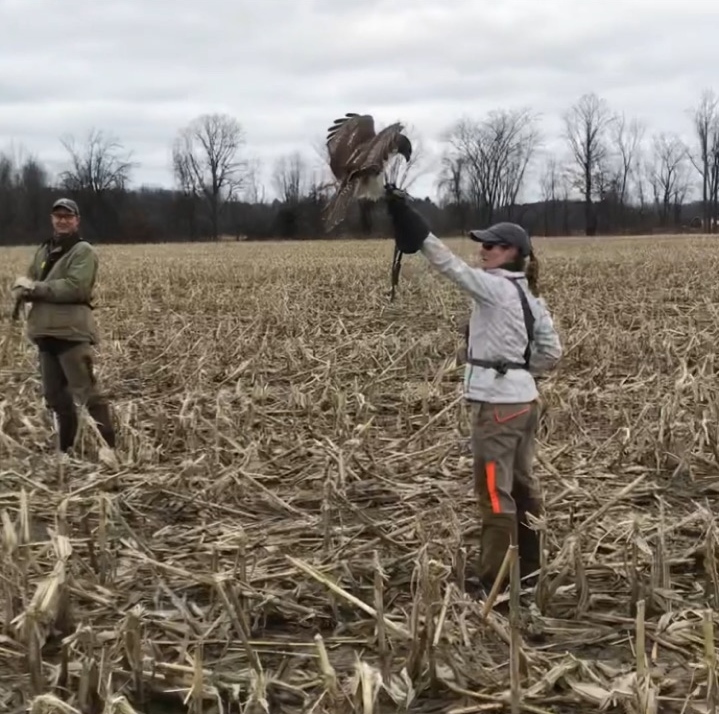 This was a unique experience provided to anyone else in the group that was interested in seeing how falconry works in the field. Chris and Kelly are members of the Michigan Hawking Club and Chris is currently the MHC Club Secretary. 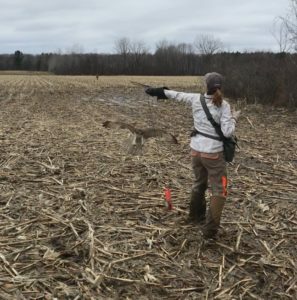 Read more to learn more about the Michigan Hawking Club, Falconry, and our experience in the Gratiot-Saginaw State Game Area! 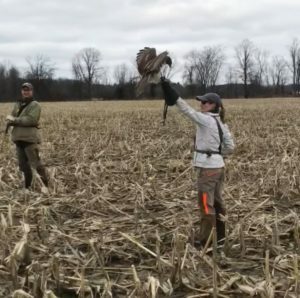 The Michigan Hawking Club is a non-political, non-profit organization whose purpose is the preservation of the sport of falconry and conservation of birds of prey. The MHC is an affiliated club with MUCC as well! Some of MHC’s goals are to promote scientific study of raptorial species, their care, welfare, and training, to promote conservation of birds of prey and an appreciation for their value in nature and in wildlife conservation programs, to promote recognition of falconry as a legal field sport and support the practice of falconry to the highest standards and to establish traditions which will aid, perpetuate, and further the welfare of falconry, and the raptors it employs. “Falconry is the sport of hunting wild game in its natural state with a trained bird of prey (raptor). Falconry in various forms has existed for thousands of years and has been practiced by many cultures around the world. It is believed to have started somewhere in Central Asia and has spread from there. As we walked into the first improved habitat site, Kelly pointed up at a good tree for Vesper to fly to and perch in. Kelly released Vesper from her arm and she flew right to the tree Kelly pointed her to. You could hear when Vesper moved to a new branch or tree from the bells that were fixed comfortably to her legs. Christopher and Kelly instructed us to kick the brush as we normally would with small game hunting, and Vesper would be following us close by watching for rabbits or squirrels to scurry out of the brush. Although most of the piles were vacant, Chris did scare off one rabbit which Kita quickly chased while Vesper pursued the chase from above; the rabbit was too fast this time. It was a great experience to see how Vesper and Kita worked together and how they also collaborated with us during the hunt. Chris and Kelly were both very generous with their time and knowledge of falconry; explaining how they developed an interest in it, to begin with, as well as how they captured Vesper from the wild. It is all very new to me and several others that got to hear their story. They captured Vesper in November last year and trained her immediately. The bond developed between the hawk, the dog, and humans is all very unique to witness. Vesper seems to know that she is benefitted by following the humans and working with the dog will help her get her meal. With just two whistles and a flash of a nickel-sized piece of deer liver, Vesper willingly flies across a field back to her human. It was especially cool to utilize previous improved habitat sites for the hunt. I often visit sites on my own, but rarely get to showcase them to other volunteers! Next up, on March 17th from 9am-2pm in the Dansville State Game Area, we will be improving hunter access trails and building brush piles for rabbitat- see more event details or RSVP to volunteer here!